The instinct to leave a mark on the world has been around since the first cavemen drew on rock walls in ancient times. While the urge to tag a building may be understandable, it can be a nightmare for the property owners and property managers who are affected. Graffiti can deter potential customers from visiting your business as well as lower the value of your property if left untreated. Removing graffiti that vandals have left on your property can be a daunting and stressful task. You’d have to spend a lot of time, money, and effort renting equipment, purchasing cleaning products, and washing your property. Fortunately, you don’t have to worry about any of this when The Pressure Washing Guys are available to provide professional graffiti removal services. After many years of experience, we know what works and what doesn’t when it comes to graffiti removal. You can trust us to deliver maximum improvement without damaging your property. 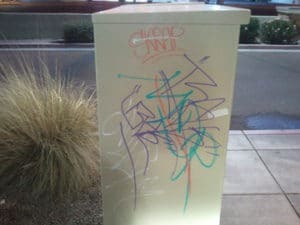 If you have some graffiti you need removed from your commercial property, call us at 949-514-7749 right away. We can provide a free quote based on the extent of the damage and the type of material that needs to be cleaned. Our prices are fair and affordable, especially considering how much being graffiti-free will improve your curb appeal and property value.